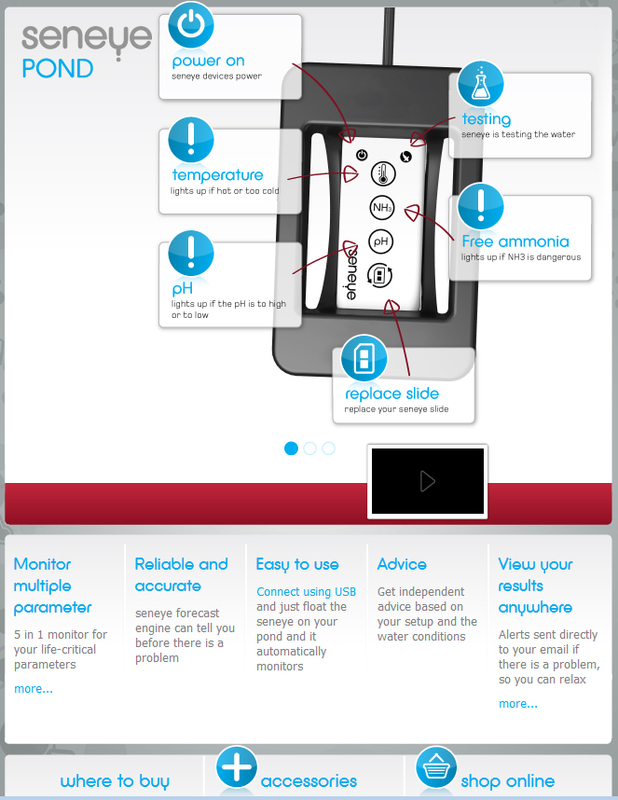 Visit their web site for full information about the device! Does Rain affect Alage Blooms? More than three-quarters of the earth's atmosphere consists of nitrogen, yet only four-hundredths of one percent of the mass of the oceans, atmosphere, and earth's crust is composed of nitrogen. Although nitrogen is not a major component of oceans and land masses, it is an essential element for the formation of proteins in both plants and animals. Rainwater does the critical job of transferring nitrogen from the sky to the soil. Nitrogen gas is a very stable two-atom molecule that doesn't easily interact with other atoms or molecules. For example, although three-quarters of every breath you take consists of nitrogen, none of that is metabolized by your body. The same is true of nearly all plants -- they can't take nitrogen directly from the atmosphere. In fact, legumes that can take nitrogen from the atmosphere don't do it directly, but through a symbiotic relationship with "nitrogen-fixing" bacteria in their roots. The bacteria "breathe" in nitrogen and convert it to compounds that the roots can absorb. Nitrogen's chemical stability means puree nitrogen doesn't mix very well with water. But nitrogen compounds, such as ammonium and nitrates, do mix with water. 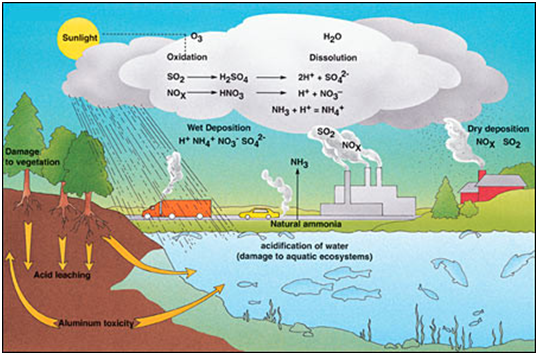 If those nitrogen compounds exist in the air, they can mix with water and come down with rainwater. The question then is, how can stable nitrogen molecules convert to nitrogen compounds? The answer is that it takes energy. For example, lightning provides enough energy to split nitrogen molecules and stimulate the formation of nitrates -- molecules with nitrogen and oxygen molecules. Bacteria decomposing animal manure and internal combustion engines are also sources of energy that produce nitrogen compounds that can end up in the atmosphere. A 2004 study of the chemical composition of rainwater at 48 sites in 31 states found nitrates in nearly all the samples, although there was a high degree of variation in both time and space. Several studies in the 1990s showed that locations along the coast of the Gulf of Mexico could expect to get 18 pounds of ammonium and nitrates per acre per year from rainwater. That's about a tenth of typical nitrogen requirements for growing crops. Because rainwater contains nitrogen in forms that plants can absorb, and plants need nitrogen to grow, farmers have noticed that rainwater stimulates more plant growth than water from other sources. That's good, in that farmers don't need to apply as much artificial fertilizer. However, in some cases human activities result in an excess of nitrogen in rainwater. 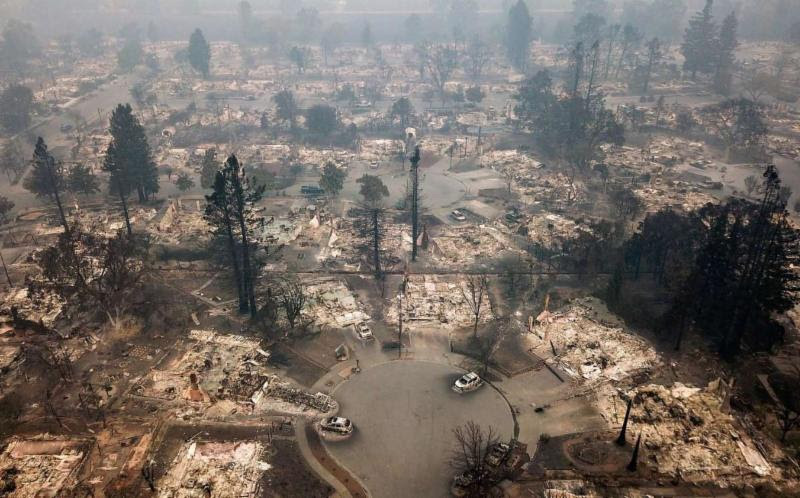 That has the effect of throwing off the balance in some fragile ecosystems where some plants -- typically algae -- that are normally limited by a lack of nitrogen now have enough extra nitrogen from rainwater to choke out other organisms. Highlights of Agricultural Research: Free Nitrogen from the Sky? We are constantly reminded not to feed our Koi too much - both for the sake of Water Quality, and for the health of the Koi. And this time of year, some of us are not feeding at all because the water temperature is blow 50 degrees. But is it possible to feed the Koi too little? First, we know that Koi food should be high protein year-round. It was previously thought that Koi benefit from feeding a lower protein level in the cooler waters of spring and fall, but now it is agreed that we should feed a single, high-protein feed year-round, and vary the quantity based on water temperature. Another thing we know is that Koi growth rates increased by 60% when they were fed 3 times a day verses once a day. Remember that Koi are grazers, and benefit from more frequent and smaller meals. So take the quantity you are planning to feed for the day, and split it up between the feedings. 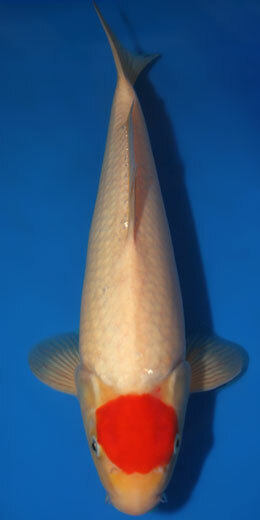 For other fish, it is recommended to feed them 0.5-2.0% of their body weight. For Koi, it is suggested to feed between 1-3% of their body weight. But does that work? The weights of Koi vary drastically even if they are the same length, and most of us do not weigh our Koi regularly. 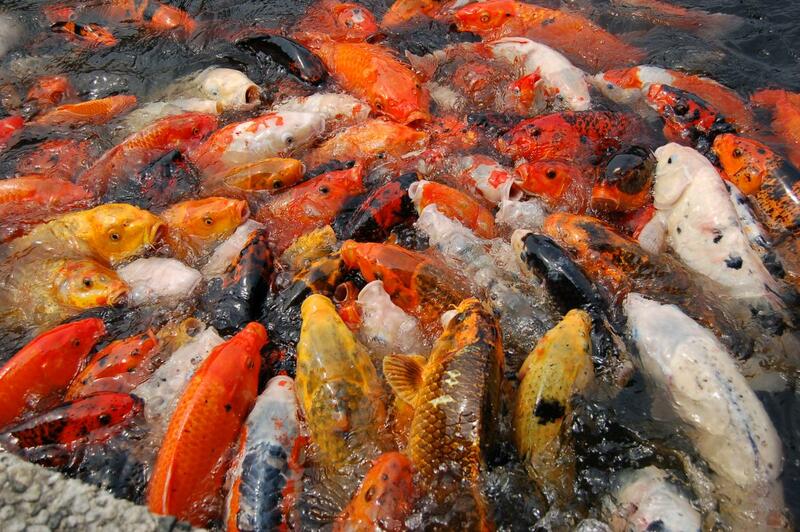 And it is not possible to limit the amount eaten by any single Koi when they are fed in a group. If a group of Koi appear to be "thin," they might benefit from increasing the amount fed at each feeding. If a single Koi appears thin, it could be genetics, or a health problem, or simply a less aggressive Koi that doesn't enjoy the melee that occurs during feeding. Most hermaphrodite Koi remain very thin, and sometimes sickly, throughout their lives. Why are my Koi yellowish, instead of white? Once I got the monster pond up and running, I bought some small Koi, and played with different foods to test growth rates. 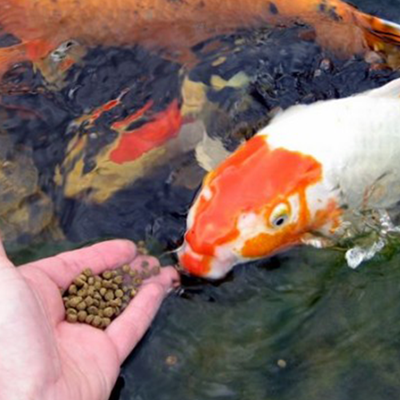 The standard food used by most high-end Koi keepers is Saki Hikari. Every other food is compared to that. I tried a high end food provided by a breeder - and the Koi didn't like it, plus it was super-oily and did horrible things to my water quality! I tried Purina Koi feed (Mazuri) - and the Koi had poor body shape and didn't grow properly. Saki Hikari was OK - sorta middle of the road. They Koi ate it, and they grew, and they looked OK. Then this year, I tried a new food just imported in the USA. Called JPD Shori - there is a another blog article about that food. Turns out that JPD is the largest producer of Koi food in Japan! Shori is their premium food. WOW - huge difference! The Koi loved it - they now wait in the feeding area an hour before each feeding! And suddenly, these middle-of-the-road Koi looked AWESOME - you can't believe the difference in the whites - instead of slightly yellow - they were fluorescent white! Which of course makes all the other colors just shine! The reds look more intense, the blacks look blacker - even the yellows had more intensity of the pigment. Go figure! You never could have convinced me that one factor - food - could make THAT much difference - but it did! Of course, it could be some combination of my water quality and the food. Maybe Shori only works with my water quality? Some of the high-end Koi keepers in my area are going to test it next year, and then we'll know if it's a one-time phenomena, or if it's something that's repeatable in different circumstances. 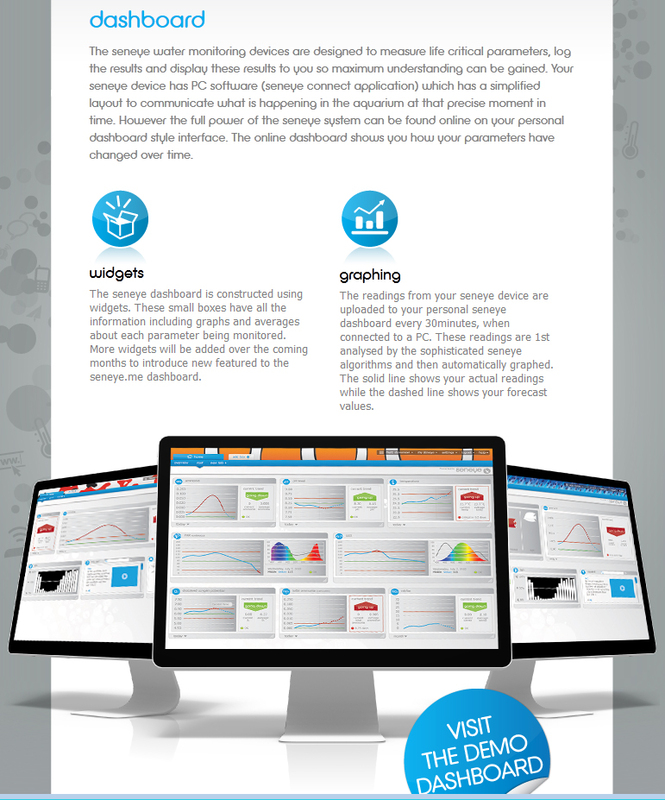 As you know, there are LOTS of other things that affect the quality of the white. The biggest is Nitrates. If you can keep Nitrates down below 5ppm, then any yellowing of the skin is coming from another problem. 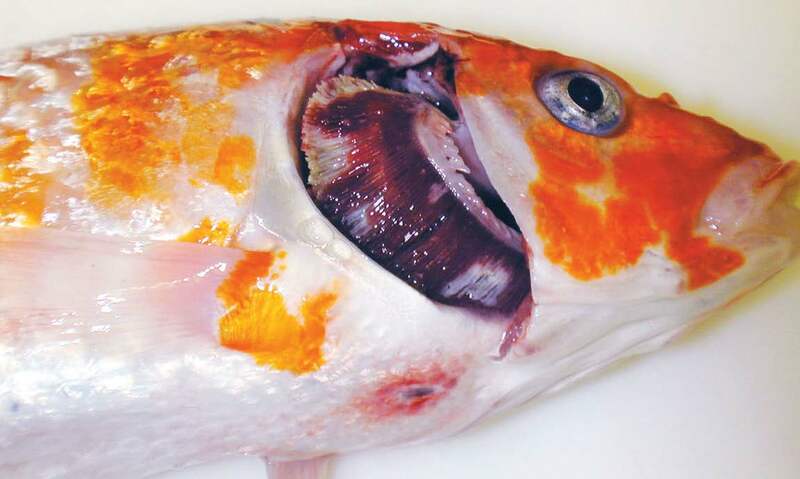 Koi that have been sick, and have compromised liver or kidneys become yellow. Color foods generally make whites look pink in my experience. I associate yellows mostly with poor genetics. When young Koi become mature, and they spawn for the first time, I always find they look better the following year after the spawn. The eggs and sperm seem to collect unwanted pigment from the rest of the Koi, and once the Koi has spawned, the Koi is left much whiter. Egg-bound females are almost always yellowish... Water changes seem to have the biggest affect on whites - because of the nitrate reduction. Plants also reduce nitrates - but somehow, Koi in plant ponds never look as good as those in ponds with massive water changes... Koi in mud ponds with green water usually have awesome colors - especially red - from all the algae. Whites can look awesome in mud ponds, or not - I suspect it depends on the water chemistry. And last, stress really affects how Koi appear... Some fish stress when you look at them! LOL Some have compromised genetics so their organs never grow properly, and they die before they are 6 - meanwhile their whites appear yellow. I guess that's why this hobby is still so fascinating after 30 years! There's always something new to learn, and the Koi are incredible teachers! 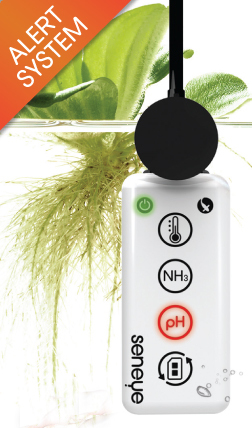 Experiment with your pond and have FUN leraning! To me, that's what Koi keeping should be all about! How a Koi became a Dragon - the Waterfall Legend. Did you know the legend of the waterfall, where a single Koi was rewarded for its perseverance and determination and turned into a dragon? One particular legend is the Koi fish’s claim to fame. An ancient tale tells of a huge school of golden Koi swimming upstream the Yellow River in China. Gaining strength by fighting against the current, the school glimmered as they swam together through the river. When they reached a waterfall at the end of the river, many of the Koi turned back, letting the flow of the river carry them away. The remaining Koi refused to give up. Leaping from the depths of the river, they attempted to reach the top of the waterfall to no avail. Their efforts caught the attention of local demons, who mocked their efforts and heightened the waterfall out of malice. After a hundred years of jumping, one Koi finally reached the top of the waterfall. The gods recognized the Koi for its perseverance and determination and turned it into a golden dragon, the image of power and strength. 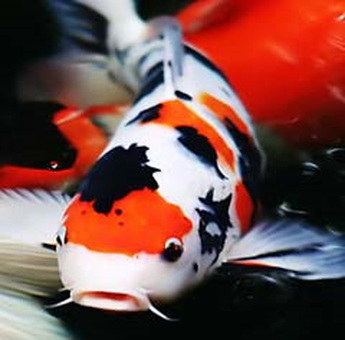 Koi fish are associated with positive imagery. Because of the dragon legend, they are known as symbols of strength and perseverance, as seen in their determinative struggle upstream. And because of the lone Koi that made it to the top of the waterfall, they are also known as symbols of a destiny fulfilled. Resulting from its bravery in swimming upstream, the Koi is oftentimes associated with Samurai Warriors in Japan. The integrity and high sense of character Koi are known for makes them a popular tattoo choice both in Asia as well as America. The Koi is known for its strength, individuality, character, and perseverance. Koi fish are also symbolized according to their coloration. Black Koi represent masculinity. It also signifies a patriarchal role. Gold Koi symbolize prosperity and wellbeing in business. Blue Koi, often associated with the role of the son, represents tranquility. Red Koi represent strength and power. It also is recognized as the matriarchal Koi. Whatever the legend or color, Koi fish will always carry a positive weight. Whether it be good fortune, longevity, perseverance, or courage, the Koi fish encompasses it all. WAY TO GO- and THANK YOU! Santa Clara Valley Koi and Water Garden Club was called in to assist FEMA / ASPCA with Koi rescue for the Sonoma Fire victim's koi ponds October 22nd. We responded . 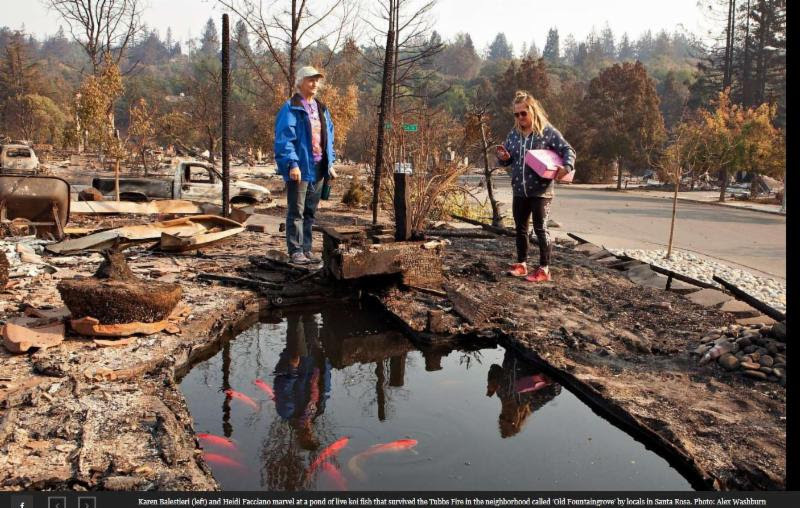 Over 150 Koi have been rescued from these wildfires so far. 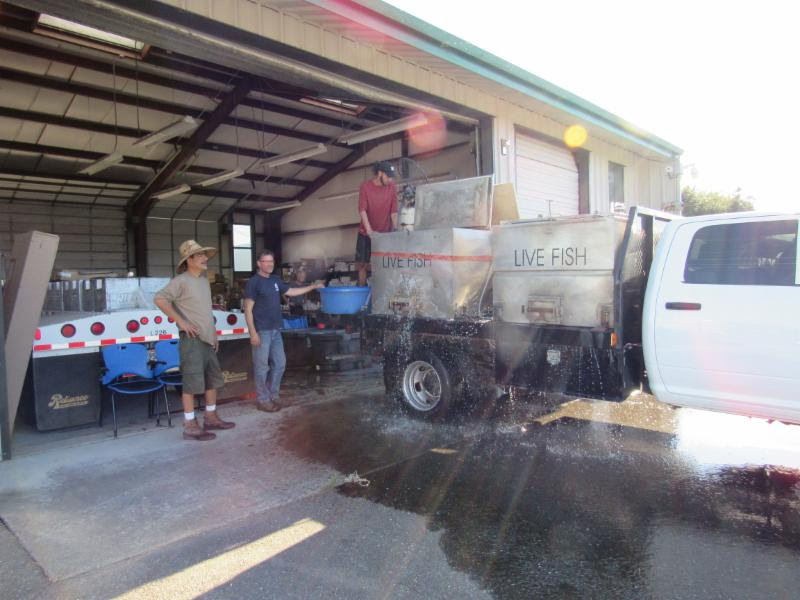 Members donated time and resources to assist by setting up temporary holding tanks and providing equipment and supplies to care the rescued Koi from fire damaged homes and properties that have been brought in by animal services. 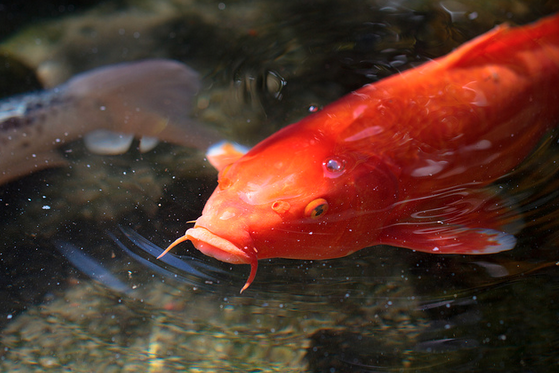 Some of the most injured Koi have been taken to UC Davis for treatment. Many of the Koi fire victims are being temporarily housed and cared for until they can be returned to their owners or, if needed, adopted in the coming weeks. 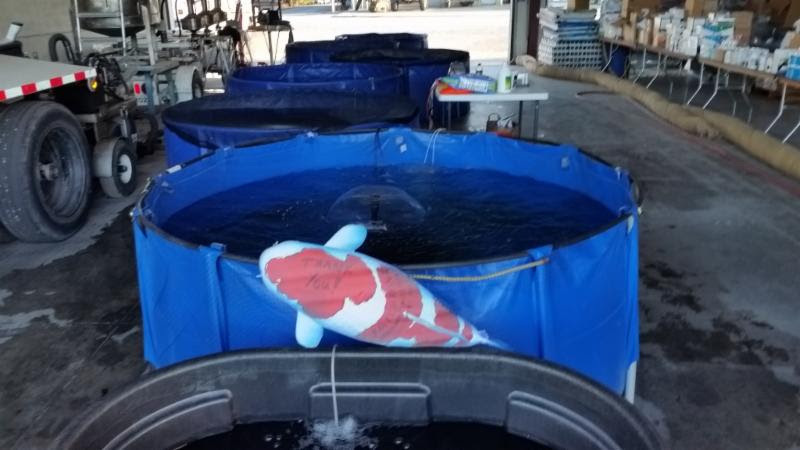 As the areas are opened up for residents to return home more Koi are anticipated to be moved to our temporary holding tank facility at the Sonoma Animal Shelter. Thank you to our membership, sponsors, and friends for for caring for these aquatic fire victims in their time of need! Bless those Koi that didn't make it. Please note that your donation is for the Sonoma / Santa Rosa Fire Koi Rescue Project. Donations are tax-deductible.